Perched seemingly on the very top of the world, is Casa Till, a new private home by WMR Arquitectos. 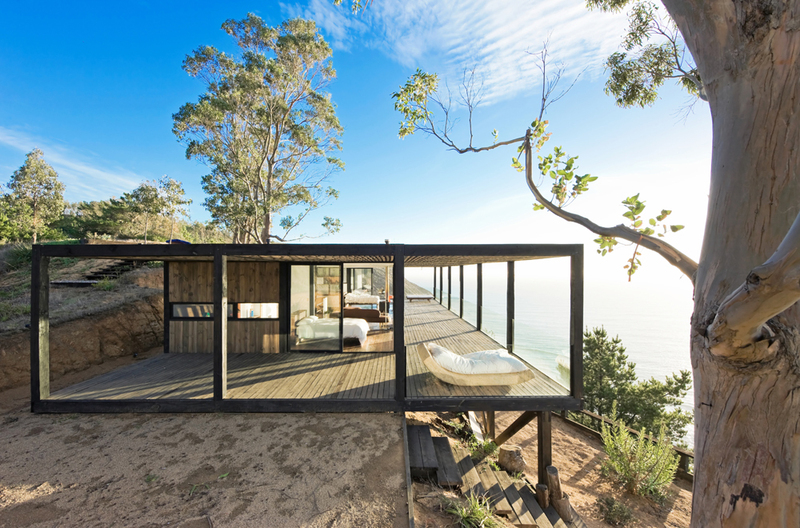 The small wooden building is wedged snugly into the windswept cliffs of Los Arcos, Chile, affording uninterrupted and astounding views of the sea and sky. In context to the 700 foot-high and 6 mile-long stretch of surrounding cliffs, Casa Till is alone in its habitat, with only one other neighboring home around, and it's miles away. Architects Felipe Wedeles, Jorge Manieu and Macarena Rabat, founders of WMR, set out to create a stylish, yet simple home inspired by the previous works of their architectural firm. WMR's German clients wished to design the building so as not to disturb the natural skyline, or even be visible from the road. The result is a long and low single story wooden construction. It's hard angles and straight lines create a striking contrast to the voluptuous landscape, but the building remains dwarfed by the mountainous terrain. The extended roof shelters a huge, gravity defying sun terrace partially built on stilts and overhanging the cliff edge. By using locally sourced Pine wood as the main building material, highly skilled local labor for the dangerous construction, and solar panels to provide electricity, the ecological footprint of Casa Till is as small as it's spare silhouette. The overall character of the home is found in it's clean, taut lines, and the feeling of spaciousness WMR created in the relatively low square footage. The open floor plan employs a system of sliding walls, allowing for flexible room sizes and privacy levels. A large bank of floor to ceiling windows allow the enormity of the environment to create a feeling of space, and enrich the living areas with ever changing hues of the sea's panorama, as a contrast to the light earthy tones of the interior. The cubist aerie that is Casa Till exists almost as it's own private island amidst the rocky heights shaped by a millennia of wind and weather. Despite it's precarious placement, the home creates a sense of safety and warmth, allowing it's inhabitants to enjoy the tranquility of isolation, and unending scenic ocean views. Want to see more? Check out this video of Casa Till.